What a fun coffee cup! 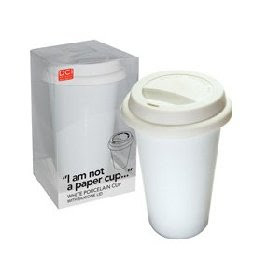 The “I Am Not A Paper Cup” cup is perfect for those who take their coffee daily from home. The cup is dishwasher safe, double walled porcelain, silicone top, and microwave safe. This is a great way to save your money and be eco-friendly at the same time. Purchase I Am Not a Paper Cup .